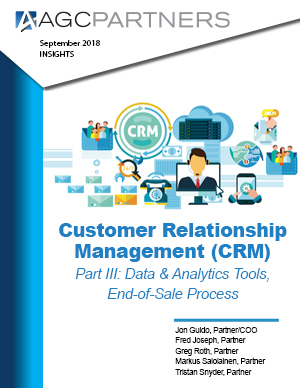 We are pleased to share with you our third and final report in the series on CRM. Part I served as an introduction to the greater CRM space, highlighting the impact of Salesforce and Dreamforce on the CRM ecosystem. Part II highlighted the importance of Data Providers and Contact Information Management in CRMs to empower users to effectively interact with their customers. Part III focuses on Data Management Tools, Analytics Tools, and the End-of-Sale process. These tools are vital to the success of efficiently using a CRM, complementing the last mile of sales and customer engagement. The report also updates our landscape of companies in the ecosystem, M&A and private placement activity.